You expect the concrete epoxy floor coatings & systems you purchase for your manufacturing operation to provide consistent industrial flooring durability and performance. That’s why we formulate our flooring solutions to specifically handle the rigorous demands of manufacturing facilities, warehouses, assembly lines, machine shops, factories and other places of heavy production. These are just a few of the benefits that make our industrial floor coatings & systems so long lasting and easy to maintain. 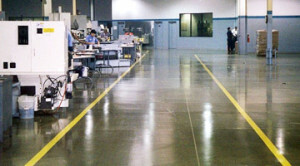 The variety of concrete epoxy floor coatings & systems that we offer for manufacturing facilities are available with a broad range of unique performance properties. 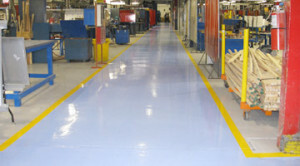 Our manufacturing and industrial flooring can be furnished in a variety of standard and custom colors and blends. Your floor can be installed with integrated floor patterns and markings for directing traffic or distinguishing work zones.